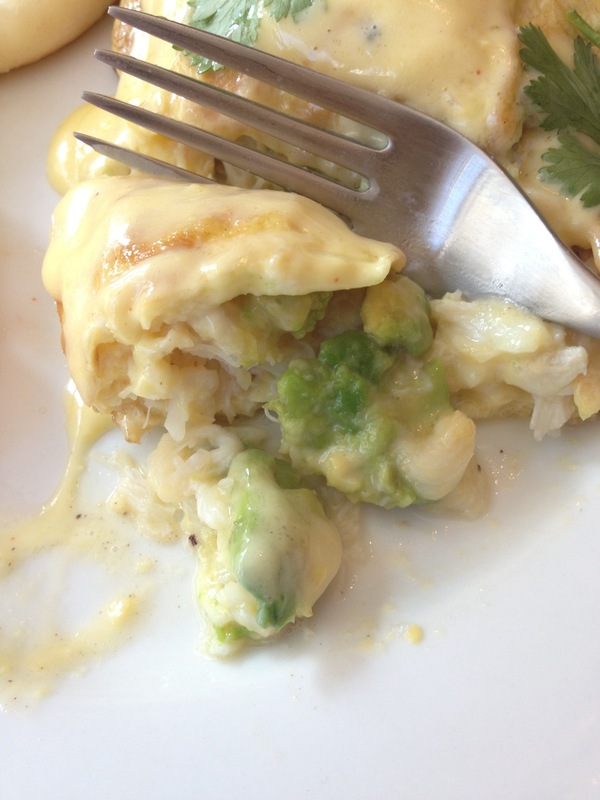 A decadent and lush omelet. Sunday was Regina’s second Mother’s Day as a bona fide mom (and not just as a super-duper-stepmom). Naturally Bennet and I treated her to a day of yummy-delicious foods that would help make her feel special and loved. 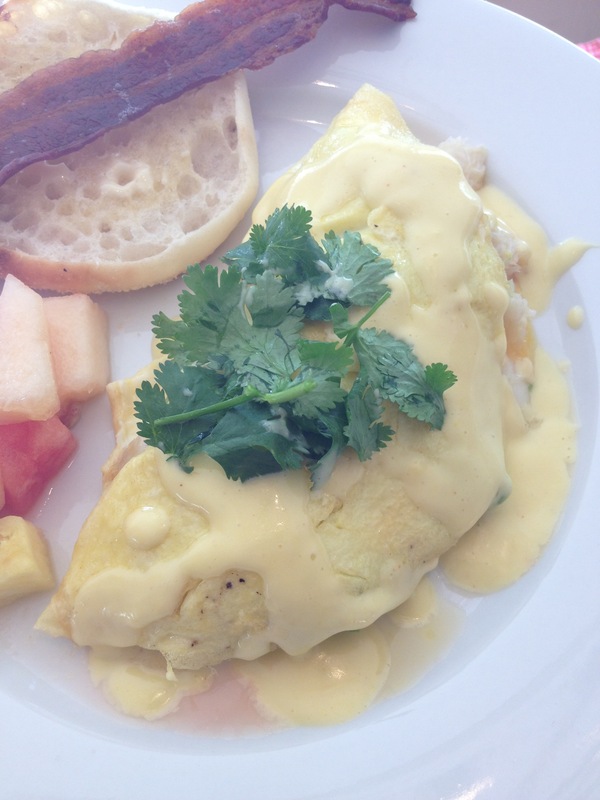 Breakfast was headlined by a dungeness crab & avocado omelet with a hollandaise sauce made with a pinch of cayenne and celery salt. Also on the plate was a toasted English muffin (from Bay’s, our favorite muffin maker) with a dab of Irish butter, a slice of crispy applewood-smoked bacon (from Applegate), and a fruit salad of diced pineapple, watermelon, and Hami melon (sort of an elongated Asian cantaloupe). A glass of freshly squeezed tangerine juice completed this perfect brekkie. 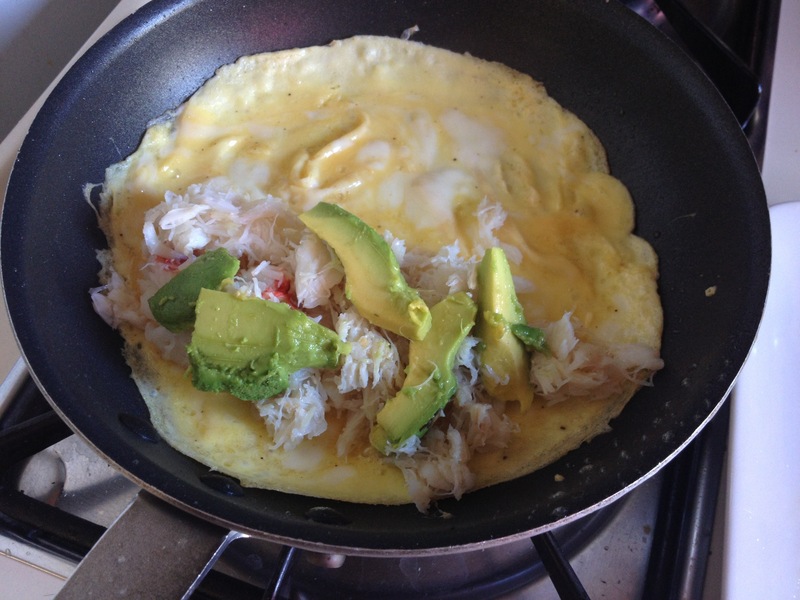 After the eggs are mostly set, add the warm crab and avocado on the half closest to you. First, make the hollandaise sauce and set it aside according to the directions below. With a fork whisk the eggs in a bowl until very uniform in color and consistency. In a small pan (not the omelet pan) melt about a tablespoon of the butter over low heat. When the butter is completely melted add the crab. Warm the crab gently and thoroughly and then turn off the heat. Now heat the omelet pan over medium-high heat and add about a tablespoon of butter. When the butter has melted tilt the pan in all directions to make sure the butter coats the bottom surface of the pan completely. Pour in the eggs and using your spatula gently push the eggs toward the middle. Again, tilt the pan in a circular fashion to spread out the whipped eggs. Season to taste with salt and pepper. Reduce the heat to medium-low and cover with the lid. Cook the eggs (maybe 30 to 60 seconds) covered until just about set, but still slightly moist-looking. Add the warmed crab to the eggs, spreading it out on half of the omelet surface, preferably the half closest to you. Top crab with avocado. Season with a bit more salt and pepper. Using your spatula gently flop the other half of the cooked eggs over the crab and avocado. Turn off heat and allow the omelet to warm through in the warm pan for about a minute. Now gently slide the omelet out of the pan onto a plate. Top with about a quarter cup of warmed hollandaise sauce and a clutch of cilantro. Serve warm and eat immediately! Set up a double-boiler. That’s going to be a medium-sized pot with a stainless steel bowl that fits in the top comfortably. Use a deep enough pot so that the bowl has at least four inches of clearance below it. Fill the pot with 2 inches of water in the bottom. Bring to a boil and then reduce to a simmer. Put the egg yolks and cream into the bowl. Whisk gently together. Placed bowl over the simmering water and whisk consistently (but not too vigorously) until the eggs have thickened slightly. If the eggs get a little clumpy you can add a teaspoon or so of water to thin it out, whisking until smooth. Now add butter, a few chunks at a time, until it melts. You need to whisk constantly after each addition in order for the butter and eggs to emulsify (combine smoothly). When you’ve whisked in all the butter (which should take about six to eight minutes) add the lemon juice and whisk it in until smooth. Add spices. Now check your consistency. Your hollandaise should be smooth, not too thick, and it should flow. If it seems dense, whisk in a little water. Now, set aside the bowl of hollandaise (off the double boiler) until you’re ready to top your eggs. Keep your pot of water at the ready. You can replace the bowl over the water, turn the simmer back on, and reheat your hollandaise just before you’re ready to assemble. Again, when you reheat the sauce, if it thickens too much, whisk in a bit of water to thin and smooth it out. This is admittedly not much of a post, but since I’ve hardly had a free moment to post in the past two months (! ), I figured I’d better start getting some content out there. Work, travel, and children have seriously cut into my writing time, but I’m back! I promise more posts this week, and hopefully I’ll be able to get OMNIVOROUS back into a nice groove. I had some leftover “broken” rice, which is fractured grains of Jasmine rice common to Vietnamese cuisine. I love the stuff for its flavor and its very specific mouthfeel. For breakfast today I fried the rice with garlic, ginger, and green onions. First I heated a couple of tablespoons of peanut oil in a very hot wok and threw in about a teaspoon each of minced ginger and minced garlic. I quickly added about a tablespoon of thinly cut scallions (white part) and stirred it around. I added about a cup and half of the cooked broken rice and tossed it all together with a bamboo spatula. I added a generous pinch of kosher salt, a half-teaspoon of granulated sugar, and nice pinch of ground white pepper. I wokked the rice until it was super-fragrant, totally warmed through, and a bit crispy in some areas. I killed the heat and stirred in about a tablespoon of the sliced scallion greens and a little minced cilantro. As a final touch I sprinkled the rice with some furikake, that Japanese seasoning shake that can contain all kinds of things from dried seaweed to sesame seeds to tiny bits of dried egg yolk to minced dried Japanese chili. This particular furikake had black sesame seeds, bits of nori, ground dried shiso leaf, and minced bonito flakes (katsuobushi for those in the know). I piled a little rice on the plate and added a couple of slices of this excellent peppered bacon smoked with hickory (sorry I forgot to note the brand). 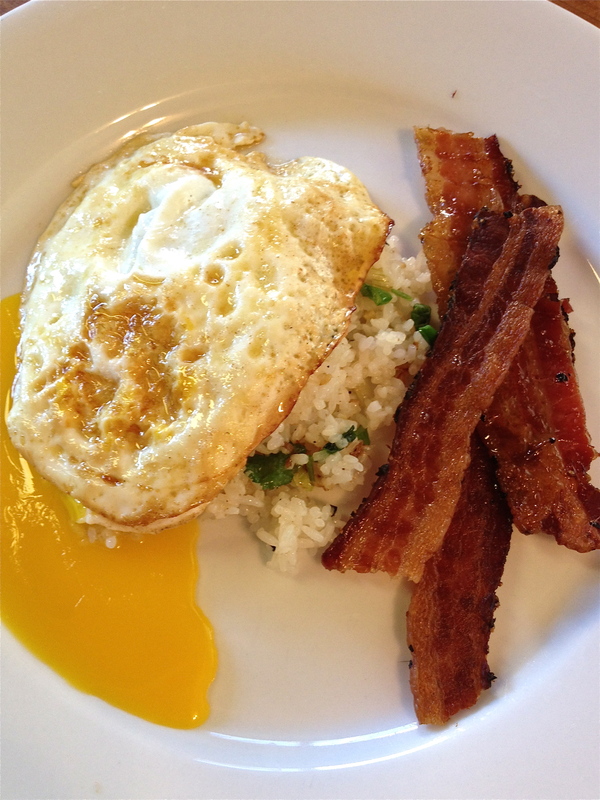 I fried the egg in a combination of bacon fat and butter and laid it atop the rice. The liquid yolk immediately burst out and ran into the rice and flooded the plate. Totally YUM! I shot this video with my son Bennet. It’s a very simple recipe for Frosted Flake French Toast. I won’t bother to post a recipe, since it’s so easy. You’ll just have to watch the video to find out how to make it! And while you’re at it, check out my other OMNIVOROUS videos. 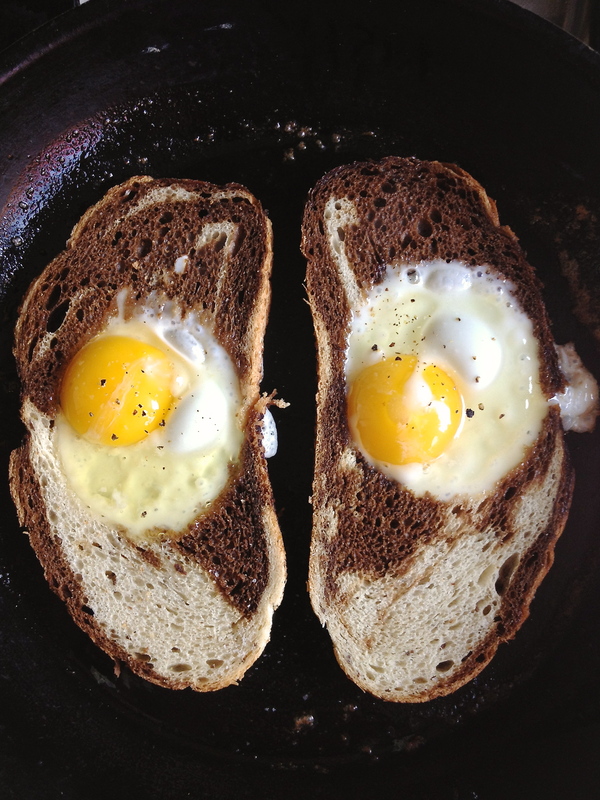 Gas House Eggs, Toad-in-a-Hole, whatever you call ’em. This dish goes by a whole bunch of names, all cute and illustrative of the dish itself — Toad-in-a-Hole, Bunny in a Nest, Egg in a Basket, One-Eyed Jack, Bull’s-Eye Eggs, Rocky Mountain Eggs, Elephant Eye, Nested Eggs, and Sunshine Eggs. In my family we called the dish Toad-in-a-Hole, but personally I prefer Gas House Eggs, which (for reasons I cannot explain) conjures up images of a mist-shrouded, turn-of-the-century Chicago where a longshoreman or journeyman mason would hunker down in a gas-lit eatery to a hearty breakfast of eggs and griddled bread and thick-cut bacon. In my (admittedly limited) research (hell, I just Wiki’d it) I couldn’t discover the reason for the moniker, so I think my imagined back-story is as good as any. I loved this dish as a kid and now that I’m a parent of (count ’em) two kids, I love to make it and eat it even more. It’s pretty simple, but there are a couple of tricks to making it well. Prep your bread, prep your eggs. I love to use marble rye for its flavor and its visual interest and the nice crunch it develops when griddled in butter. The loaf I bought had half-inch slices, although generally I prefer a thicker-cut bread. When you use an inch-thick slice the egg will take a little longer to cook, which is preferable if you like a runny yolk (which I do). Ergo, the thicker the bread the smaller the hole you should cut. For this thinner bread I used an old-fashioned glass (as in the cocktail) with a rim three-and-a-half inches across. For thicker bread I recommend a hole about two-and-a-half inches in diameter, so choose a smaller glass. To make the hole gently press the glass rim-side-down into the bread until it cuts through the bread. Be careful not to tear the bread. After you make the cut carefully remove the bread circle from the glass. You can toast it separately and serve it as part of your breakfast. When prepping the eggs I crack them and put them separately into small dishes or ramekins; this reduces the likelihood of the yolks breaking before you get them into the bread hole. For a final (non-traditional) touch I sprinkle a tiny bit of thinly shredded cheese on the flipped side. This adds a little extra flavor, and hell, I’ll add cheese to just about anything! Why is my skillet staring at me? I had cooked a little Neuske’s applewood-smoked bacon for this breakfast so I used a bit of the rendered bacon fat to cook the Gas House Eggs. I heated my skillet up over medium heat and added a tablespoon of bacon fat and a tablespoon of softened butter. When the butter melted I added two slices of the cut-out marble rye and crisped the first side for about one minute. 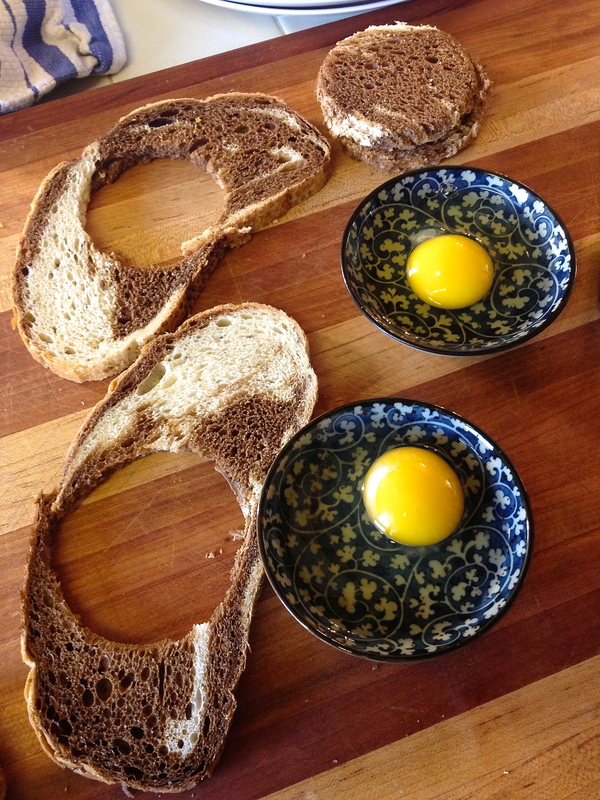 With a spatula I flipped the bread and carefully slid the eggs from the little dishes into the circles. I then seasoned the eggs (and bread) with a bit of fleur de sel and cracked black pepper. I cooked the eggs for another minute and then gingerly flipped it again. 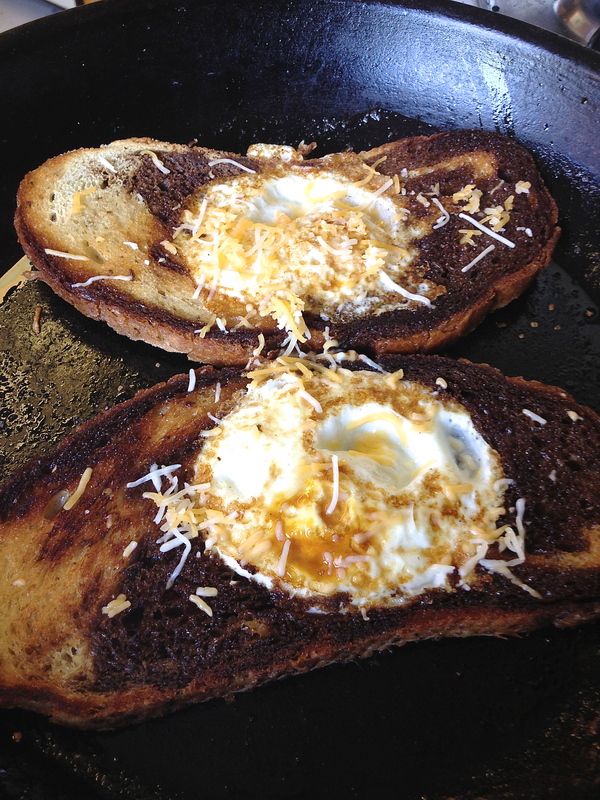 I sprinkled a little grated cheese over the egg and bread and cooked it for another 45 seconds or so. I removed the eggs from the pan and put them on plates. In the same pan I toasted the cut-out circles in a little butter until slightly crunchy. On the toasted cutouts I schmeared some cream cheese and a delicious mixed berry jam. A wee sprinkle of finely grated cheese is a nice final touch. A mighty fine Saturday morning brekkie! 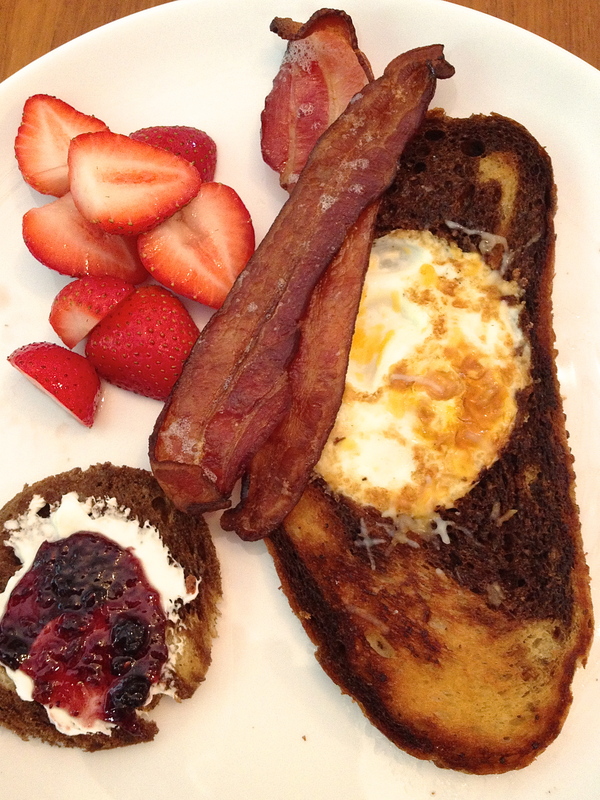 To complete my breakfast I added some fresh-cut strawberries to the Gas House Eggs, the applewood-smoked bacon, and the cream cheese & jam toast. I had my usual cup of unsweetened steaming-hot Oolong tea to wash it down, and Regina and Bennet and I sat down to a fantastic brekkie. 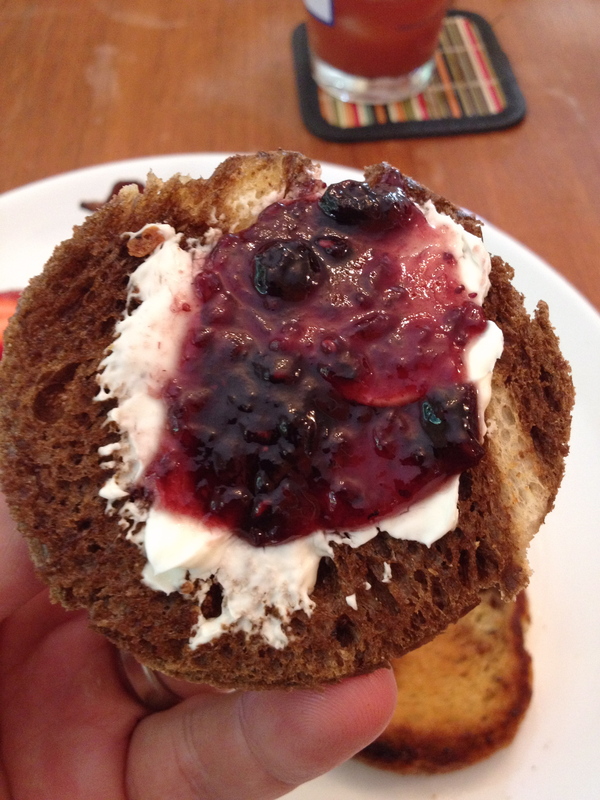 Mixed berry jam and cream cheese spread on the toasted circle. Not runny enough for me, but tasty, tasty, tasty. 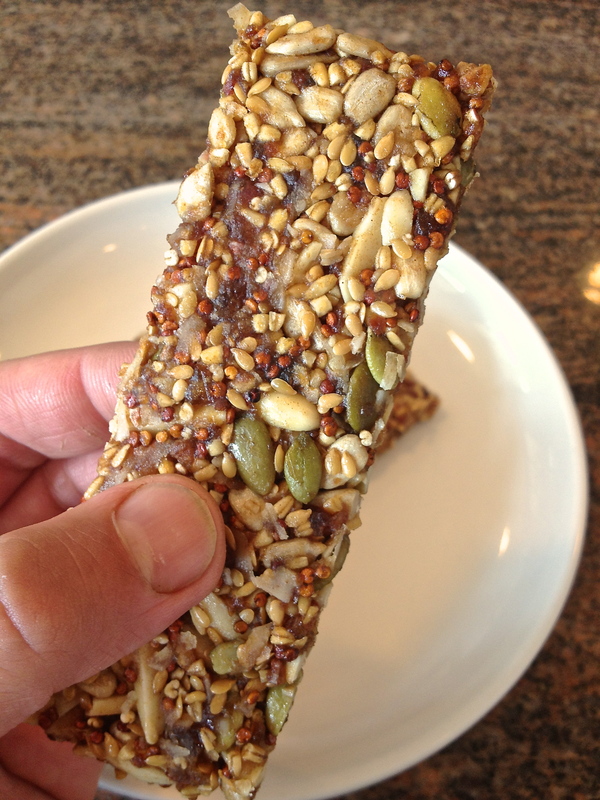 Super-Crunch granola bars are tasty and will keep you regular. No, seriously, that’s a LOT of fiber! A few days ago I made these fantastic and super-healthy raw granola bars from a whole mess of seeds and nuts. Pumpkins seeds, steel-cut oatmeal, flax seeds, quinoa, sunflower seeds, and almonds are all considered very good for your digestive health as well as being natural cholesterol-reducers. The final bars are dense with nutrients; sweet, seedy, nutty, and tasty. And they’re extremely easy to make! Roll out the mixture between two sheets of lightly oiled parchment paper. About a half-inch thickness is ideal. First soak your chopped dried dates in about two cups of warm water. Allow them to soften for 30 minutes. Drain off the water and puree the dates in a food processor until smooth. Into a large mixing bowl combine the date puree and everything else. Using a rubber spatula or a wooden spoon stir it all into one big sticky mass. On a cutting board spread out a sheet of parchment paper and spray with a light coating of canola oil. 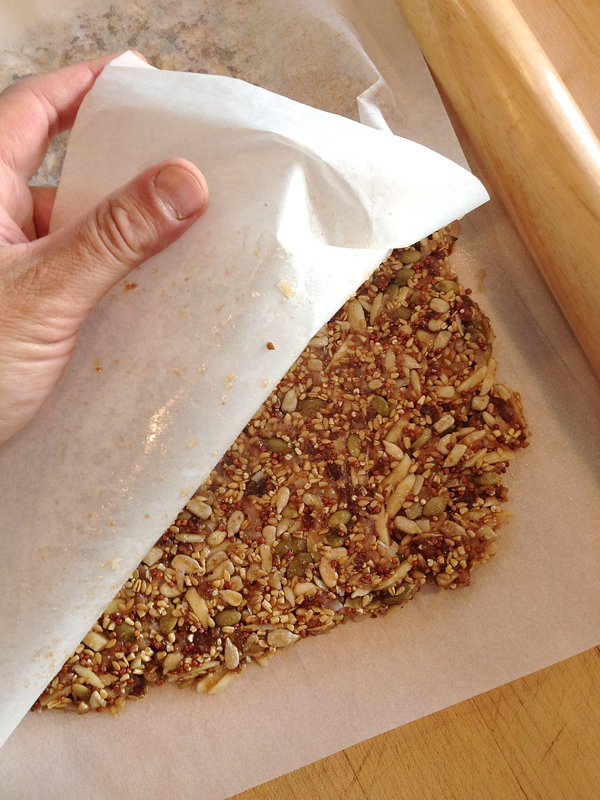 Spread the granola bar mixture on the parchment and spray the top of the mixture with a little more cooking spray. Cover with another piece of parchment and press down with your hands to flatten. Using a rolling pin gently flatten the mixture until it’s about a half-inch thick. Peel off the top layer of paper and discard. Using a sharp, long knife cut the granola (and the paper) into squares about 6-inches on a side. Place the squares (on the paper) on your dehydrator racks and set the temperature to 135º F.
Dry the granola bars for about eight hours and then test your granola bars. If they hold their shape but are still sticky you can cut each into smaller bars. I cut my bars about one-and-a-half inches wide and six inches long, but you can cut them any size you want, of course. Return the cut bars to the dehydrator and finish drying. It took me another ten hours to dry to the consistency I desired. I wanted the bars to hold their shape but not be hard as rocks. A total of 18 hours was needed. They were totally worth the wait! 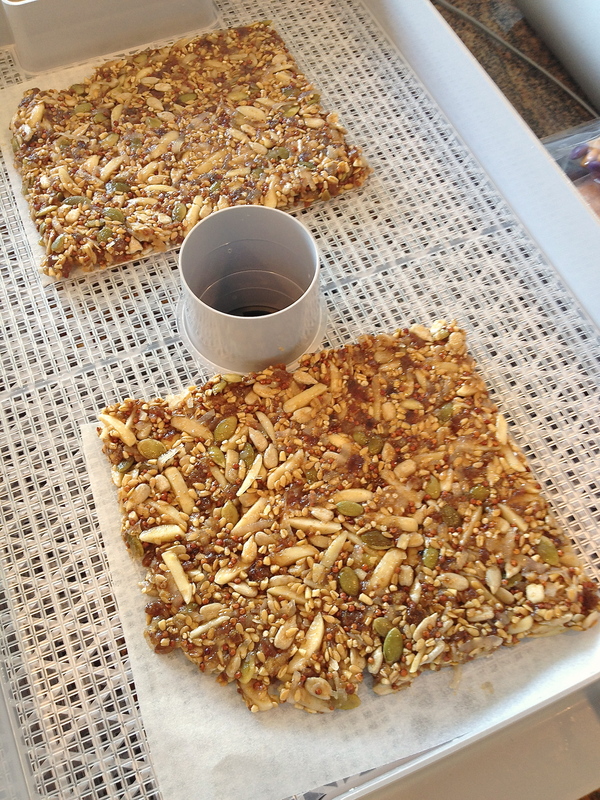 Dehydrating these bars took about 18 hours total. But they were worth the wait! If you like this recipe, check out my recipe for super-crunchy, super-healthy granola! I admit this isn’t much of a post. Nor is it a particularly good picture. However, this light healthy breakfast was super-delish and I had to share it. I toasted some whole-grain sunflower bread and spread a little organic creamery butter on it. 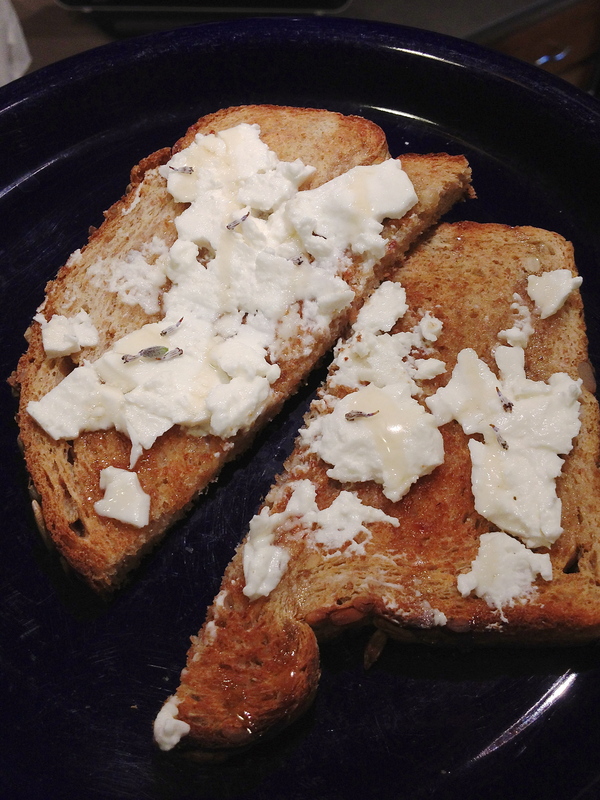 I had some of this superb, very soft goat milk feta cheese which I crumbled and spread on the toast as well. I drizzle a little honey over it and scattered just a few tiny florets of fresh lavender over the feta. A tiny sprinkle of fleur de del completed the dish. 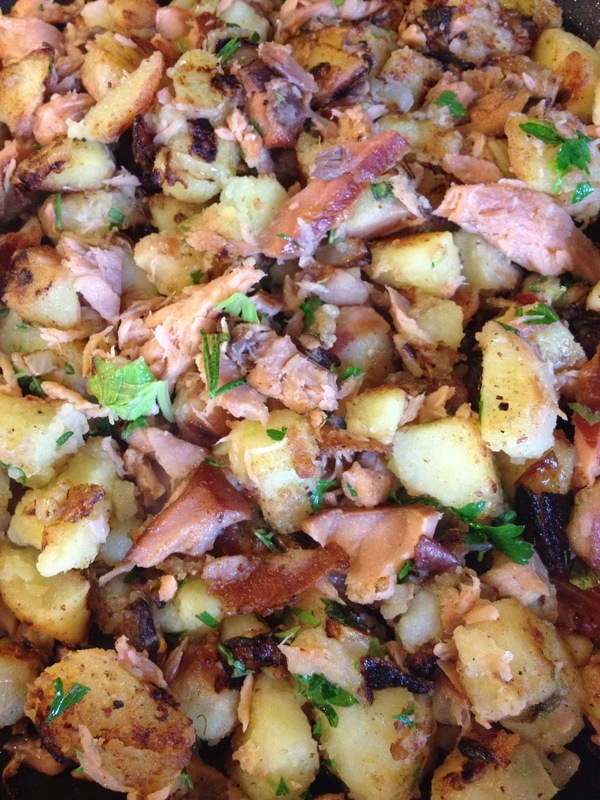 This morning I made a lovely and simple breakfast hash with some excellent local smoked salmon. My father has a small potato patch and he dug up a few very fresh, waxy, red-skinned potatoes. In a small pot I covered the potatoes with cold water and boiled them until fork-tender. I drained the taters and when they were cool enough to handle I peeled them, mostly. I left on about 20% of the skin for a little texture. Next I cubed them roughly and set them aside. I cut up half of a small onion into a large dice. I also chopped up one celery stalk, a small piece of fennel bulb, and one very large garlic clove. I then minced a little rosemary, some lemon thyme, some parsley, and a tiny fistful of celery leaf. I broke up a big handful of smoked salmon into flakey chunks; this was hot-smoked “kippered” salmon, as opposed to lox or nova, although you could use pretty much any type of salmon you wanted. Or you could use smoked trout or cooked lobster meat or big chunks of crispy bacon if you wanted to. Into a hot skillet I swirled about three tablespoons of olive oil and added a tablespoon of butter. I threw in the onions, celery, and fennel. I added a big pinch of kosher salt and a generous amount of cracked black pepper. I sauteed all that over medium high heat until just barely browned and then added the potatoes. I stirred the ingredients together until well-combined and let the potatoes brown on one side until crispy and golden. I stirred in the salmon and the herbs and cooked for about five minutes over high. I checked for seasoning, added a bit more salt, and then killed the heat. It was ready to eat. And it was yummy! 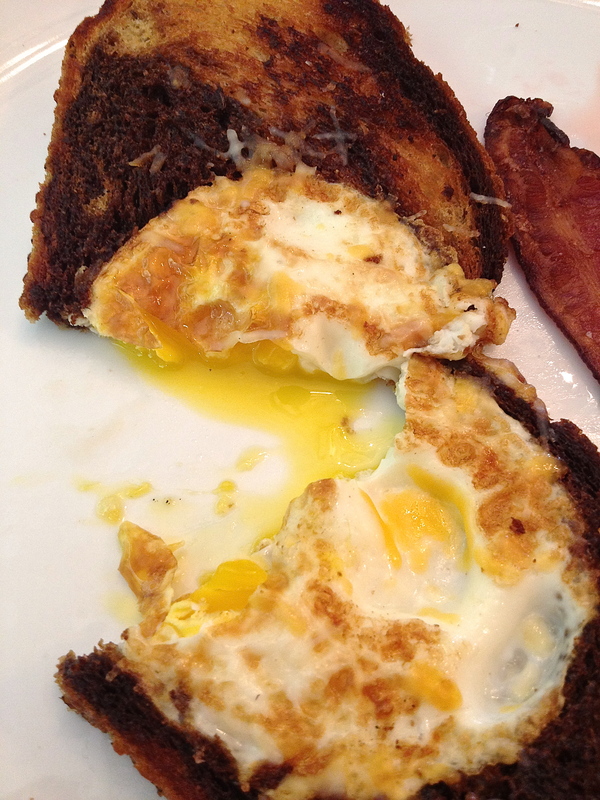 Fried up a couple of farm-fresh eggs and had a fantastic brekkie.